I mentioned in my previous post that we had made chana masala instead of this stew because of the weather. I know it’s called a “stew” but I really feel like it was more of a soup than a stew. Well, I made the soup on Tuesday (last week)! I was a bit apprehensive because I’ve tried a tomato based soup recipe from Veganomicon which lacked a lot of flavour but was still willing to give this soup a chance. I’m glad I did. 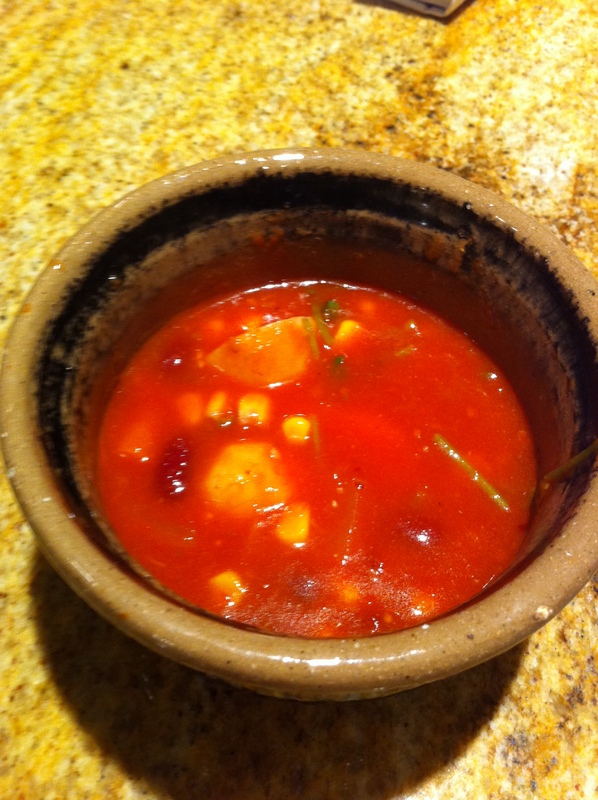 The sweetness of the tomato with underlying notes of tangy lime and cilantro really worked, and worked well in this soup! Saute the onions in the olive oil on medium heat for approximately 5 minutes. Then add cumin, garlic, salt, and pepper. Saute for another minute before adding water, tomatoes, and chipotles. Then add potatoes and carrots. Bring pot to a boil, cover, and simmer for 20 minutes. After 20 minutes add beans and corn. Use more water if needed. Then cook uncovered for 5 minutes. Add lime juice, zest, and cilantro. This soup made a lot, so we froze it and have had it for dinner a few times. I really liked the combination of the lime with the tomatoes. When I tried the soup (prior to adding the juice) I felt worried that the soup was way too tomato-ey but the lime juice really complements and balances this meal, especially when you factor in the cilantro! 🙂 It was fun zesting the lime because I got to use my microplane grater for the first time! It worked so well. As an aside: I’ve been really enjoying experimenting with cooking now that I’ve gone vegetarian. I’m really enjoying being a vegetarian as well. It’s been relatively painless which is amazing, but I also feel really great. I remember after eating a huge meal with meat I would feel really heavy and sluggish. Now that I’ve gone vegetarian though I don’t find that. I don’t find I’m eating more either, but I’m eating a varied amount of food. I’m trying hard to make sure I get enough protein, but otherwise I haven’t had to change much. Coming up with new dinners has been really fun!